This is a simple 4 click process… (1) Open the first pdf file, (2) Open the thumbnails draw (3) Drag in the second pdf file and (4) Save the new pdf. Here are some pictures to help you do it! Step 1 – Double click the first pdf file to open it. Step 2 – Switch to thumbnail view. You can also do this from the top menubar – in the View menu click Thumbnail. Step 3 – Drag the second pdf file anywhere into the thumbnail window. This copies the whole pdf file in. Step 4 – Save. It will overwrite the original pdf. Some people are reporting this is not working. (See the comments below). I have no idea why except that maybe you have a different version of the Preview app. Try the instructions in this post even though you don’t have Leopard and it will work! To make a new pdf preserving the original one use ‘Duplicate’ then ‘Save’. To copy only one page, open the second pdf page in thumbnail view and drag just one page across. thanks so much. this was incredibly helpful!!! Seemed to work fine. I combined 4 files together (15 pages total), I just needed to add one more page from one last file, and it wouldn’t allow it. Every time I dragged it over, that last page would just float back to it’s original pdf. Any ideas? Maybe the last pdf file is locked? How can I tell if it’s locked? Are there any other ways to unlock it, other than the app “PDF Unlock” that RAM suggests above? Doesn’t work for me. I repeated the process 8 times and it doesn’t work. I drag the file in, save it. I open the updated file and I on have the first page. I can’t seem to manage it (10.8.5, two one-page pdfs opened in Preview, both selected in the thumbnail sidebar, save to pdf from the print menu, reopen the document and still only one page in it–nothing works). No, sorry, doing what I just wrote *did* work. I had to make sure to select both documents in the thumbnail sidebar (shift + click) before saving (from the print menu). So easy! I love this about mac. So many hidden things that makes your life easier once you find them.. Fantastic; well explained and the more I use apple the more I love it ! The greatest problem is trying to find out all the good stuff tucked away in the software ! Thanks for the article and to Muffinhead – the article should be clarified as it only works if you drop the incoming file on top of the destination thumbnail. However this merging procedure corrupts all the html links in both files (except for the mailto: links). So be warned. 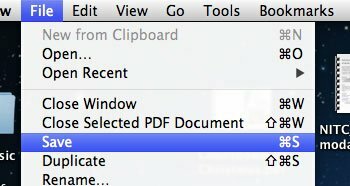 FYI: I’m on 10.8.5 and I used Word 2011>print>save as pdf to make the pdfs. I guess things have changed since the original post. It’s October 2013 and I’m up to OS X 10.8.5 and Preview version 6.0.1. I did make a single big PDF out of several different PDFs by drag and drop but it depends on exactly what you drop and where you drop it. If you drop files from Finder into Preview you get separate PDF files shown in Preview. That’s not what I wanted. 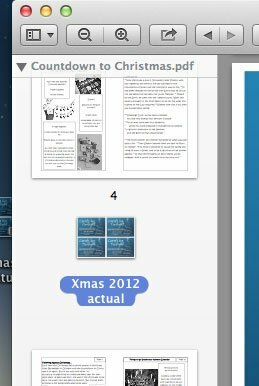 Let’s say I open PDF 1 in Preview window A, show thumbnails, and make sure I have page thumbnails, not file thumbnails. 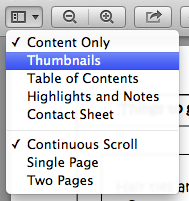 Then I open PDF 2 in Preview window B, view thumbnails, select all the page thumbnails, and drag them. 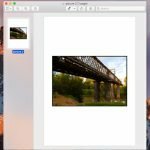 If I drop the thumbnails into window A below the existing thumbnails I get the same result as if I drop a file from Finder. Window B closes and window A shows PDF 1 and PDF 2 as separate files. Instead, I dropped the thumbnails from window B so that the topmost thumbnail that I dragged partly overlapped the lowest thumbnail that was already there. That copied all the pages from PDF 2 into PDF 1, after the existing pages. Now you want to Save As so you don’t overwrite PDF 1. There is no Save As in the menu. You get it by using Duplicate and then Rename. I’m using 10.9.1 and they’ve totally messed up what used to be an easy to use feature. Documents don’t want to combine anymore. All the “improvements” in Pages, Preview and Numbers seem to be straight from the software demons from hell whose sole mission is to frustrate formerly happy Apple users. Thanks to the person who suggested using the Print as PDF feature because that finally let me combine added pages into one document. CAN WE START A PETITION TO BRING BACK “SAVE AS”? Should have read the comment above mine. Overlapping works. Now we still need “Save As” again. Why on earth would they eliminate this easy, one step process and substitute 2 less easy steps? Macs used to be so intuitive. I think the company has been infiltrated by Microsoft operatives. thanks heaps . That works well . great works perfect, saved me time and money from not having to download ‘free’ trials for pdf merge software…. Yes, the simple drag-and-drop does NOT work, at least later ML iterations. You must drag and OVERLAP the last thumbnail in the target thumbnail-column before releasing the button. Or else you can go to Print and then save it there as a PDF. I’ve tried both ways, both work. ‘Drag each page’s thumbnail image from its original document to the other document. There is no rectangle (a grey rounded outer rectangle around the selection-grayed thumbnail) except for the first thumbnail. All subsequent dragged thumbnails elicit no such phenomenon, and it doesn’t matter: you need only drag the incoming source thumbnail unto or overlapping the last thumbnail (in the source-doc’s thumbnail-column). You won’t see any outlining rectangle to show you have properly overlapped—a violation of Apple’s user-interface directives—you simply have to visually guide the source thumbnail over the target thumnail so that they visually appear to overlap. Then you can release the button. It will drop into place below, exactly the same visually as the non-working drag-and-drop method. There’s still no special indicator to show the page has merged (or will-merge) status. The PDF will then truly combine them all in a single PDF when saved, but there’s nothing in the Help stating or implying this essential ‘OVERLAP’ method. All I can say is that this article needs to be revised. It has taken me a couple of hours just to get these pdf’s all in one file and I was going crazy until I read the comments on how to drag and drop them. Apparently there are more ways than one to drag and drop…The directions saw drop anywhere in the thumbnail window. NOT the case you have to drop on top on of each pdf as if you wer stacking them on top of each other! 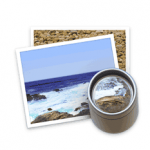 Do you have OS X 10.8 Mountain Lion? How do I know if I have mountain lion or tiger or monkey…..All I know is I spent days trying to figure out my new iMac Not so easy. My Microsoft PC sent PDF’s and large files with no problem. Attach and click send. No problem. NOW I have huge problems with iMac Files will not send. Just go to ‘About this Mac’ from the Apple Menu and it will tell you what version it is.